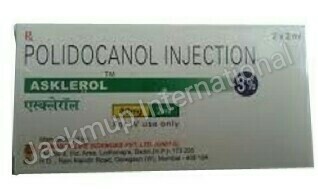 Description:- Asklerol 3% w/v injection is used in the treatment of varicose veins (dilated veins of leg). It belongs to a class of medication called sclerosing agents. It locally damages the endothelium of blood vessels, leading to platelets aggregation, thereby leading to formation of blood clots as well as scar tissue which in turn reduces the lumen of some enlarged veins.